I'm going to tip my hand right away and say this about my trip to Fire-N-Smoke. I don't care if you trim your brisket before or after you cook it, but for the love of BBQ trim it before you serve it. A litte fat on a brisket is expected, but this was waaaay too much. Sorry for the rant, now let's talk about the rest of my visit. 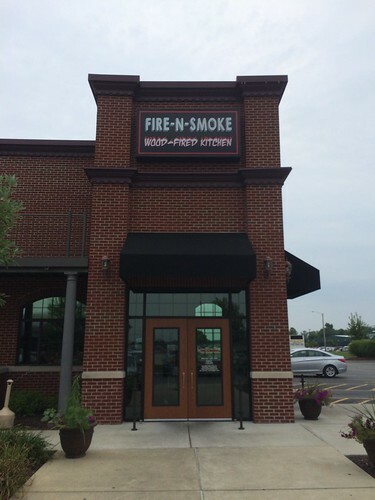 Fire-N-Smoke opened recently in a location that has been a couple of different restaurants over the past few years. Luckily for them, the shopping area round the location seems to have reached critical mass and there's enough traffic flow that they should be able to make a go of it. Not to mention, the facility lends itself nicely to being a BBQ joint. 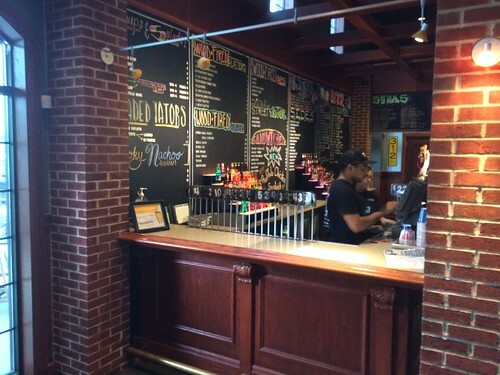 Like most BBQ joints these days it seems, the menu is a giant chalkboard and orders are placed at the counter. I was pleased to see that they seemed to have all of the bases covered, as well as having a long list of salads, sandwiches, etc. I ordered the 2 meat platter (like I normally do when I'm trying a new place), and the Mrs. ordered her usual pulled pork sandwich with baked beans. The food was delivered quickly and looked awesome. I was pleased to seee a nice smoke ring on the brisket and see that the pork was truly pulled and not chopped. The side dishes were served uniquely in individual sized pie tins, and the whole mess was piled on a large tray covered with butcher paper. In the case of the platter, bread & butter also accompanied the meal. The brisket was my favorite, despite my earlier comments about it needing to be trimmed. The pulled pork was good, although it suffered a little from being re-heated. The Mrs. liked the addition of cole slaw to the sandwich. 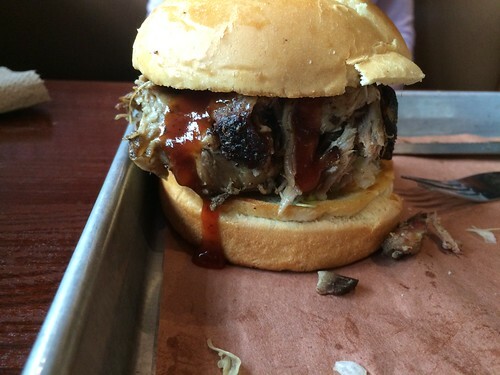 That's the way a pulled pork sandwich should be served after all. The beans were good, if only dressed up canned beans, but the sweet potato dish was outstanding. There was a thin sauce spread across the meat on the platter and a little bit on the sandwich. My wife's only complaint was that she'd like to have had a little more sauce, though oddly enough there was no bottle of sauce on the table. In this day & age, most places overwhelm you with sauce choices so it was odd not to find any at all on the table. Zip, Zilch, Nada. I was a little surprised at the light crowd at 1:00pm on a Saturday, but I think Fire-N-Smoke should do just fine. As I said, they definitely have a good location, although there is plenty of competition from other restaurants as well. 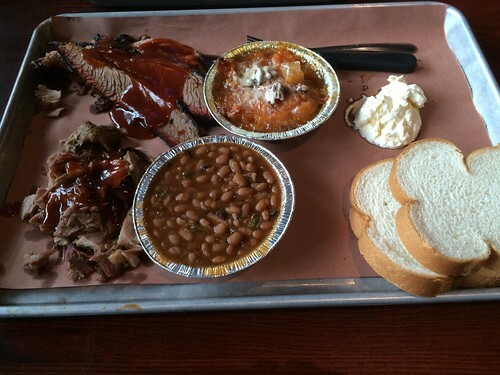 Here's how I'd rate my trip to Fire-N-Smoke in O'fallon, IL. I'd recommend this place and I'm sure I'll eat there again. Here's the specifics on Fire-N-Smoke.